Supportive & Cooling Underwear for Varicocele Treatment! Every case of varicocele is different! Everyone has causes for testicular aching and pain from varicocele. To treat and get relief from the constant (or coming and going) of varicocele pain, we must therefore correct our specific lifestyle risk factors, treat varicocele toxicities, improve blood draining from the testicles, and stimulate testicular health. Lifestyle risk factors: Sitting, masturbation, poor diet, and hot showers. Varicocele toxicities: Oxidizing agents, toxins, and overheating. Improve testicular circulation: Varico Health Kit, STUD varicocele underwear, and treating Nutcracker syndrome. Testicular health: Normalizing testicle temperature, improving diet, exercising, and restoring normal blood circulation. Try those corrections and treatments now, and you will have varicocele pain relief in no time. Start your Complete Treatment now! Yes, you can cure Varicocele Pain at home. Look guys, the video below has 3 treatments to help you reduce your varicocele pain. If you want a complete treatment treatment program for varicocele swelling, pain, and infertility, visit my website, and get the Healing Guide. That's really the best first step. This video is just here to help you get pain relief so that you can recognize that--YES, you can treat varicocele naturally. Natural treatments really do work. So, when you're ready to start your complete treatment program, buy The Complete Guide to Natural Healing of Varicocele! So, here is the video. I outline 3 treatments for varicocele pain there. When you put your feet up on the wall, you allow your blood to drain out of your veins with the aid of gravity, not against it. This allows healthy blood to finally reach your testicles. This is a great natural treatment for both toxic blood pooling and allowing the testicles veins and testicles time to heal. Varicocele prevents the testicles from cooling. When your testicles cannot cool, they over-heat. So, everyone who has varicocele needs to ensure their testicles are kept adequately cool. Prevent heat-damage, cool your testicles daily. Now, science has actually shown a causal relationship between Reactive Oxygen Species (ROS) and infertility. ROS damage sperm, sperm DNA, as well as the testicles and veins. So, what's the solution? A diet rich in anti-oxidants is proven to help make a big difference. As I mentioned previously, if you're looking for a complete solution, get my premium programs! They're very affordable, and are the best option for varicocele treatment. Cure your pain, and reverse varicocele. Make the right decision, start now. Experiencing Testicular or Varicocele Pain? Will Varicocele Pain Go Away? I know it might seem like varicocele pain comes and goes, but normally, varicocele pain worsens with time if left untreated. Pain in general is an indication that something is wrong, and that you need to do something ASAP. Don't wait for your symptoms to worsen. Aching and pain from the effected side indicate that the testicle is under-stress and is being damaged by varicocele toxic blood pooling. Most damage is reversible, however, some damage is permanent. Therefore, it is imperative to treat the cause of the pain as soon as possible. Can you cure varicocele pain at home? Yes. There are specific lifestyle changes and treatments for varicocele toxic blood pooling that are very effective and can be done at home, without surgery. So, don't wait, start your treatment now. Here is a snippet from the Varicocele Pain Relief Guide. Continue reading for several varicocele pain relief treatments that you can begin implementing right now. Try these treatments. I promise you will notice a difference. A small and effective guide to cure varicocele pain. The Varicocele Pain Relief Guide: Cure or significantly reduce your varicocele pain in just 30 days, or your money back. This guide is simple, to the point, and covers over 70 of the most effective varicocele pain treatments. Now on Amazon! Poor circulation leads to poor cellular nutrient exchange & waste removal. Moreover, poor circulation increases blood pooling. Pooled blood is toxic blood; it damages tissue & causes pain. You can drain your varicocele by performing inversion, or cooling exercises (see Chapter 3). Inversions are any pose or exercise where the hips are elevated above the head. For example a headstand is an inversion. Inversions allow the blood in the veins to flow back to the heart with the aid of gravity. On the other hand, cooling constricts (tightens) the varicose veins. Constricted veins just do not have room for blood to pool. For left-sided varicocele, when lying down, bend to your left side. This is super effective and helps alleviate the Nutcracker Effect. Don’t sit for more than 30 minutes at a time, get up and walk around for a minute (this reduces head, alleviates pressure from poor sitting posture, allows stagnant blood in the varicocele can circulate, etc.) Sitting time is also related to development and severity. The Varicocele Pain Relief Guide (simple & effective). Update: 3rd edition comes with all new treatment! E-book: Now only $15 USD. ✔ Backed by my 100% money back guarantee. No-questions-asked 100 percent complete money-back, ninety-day guarantee if you can't honestly state that your varicocele pain has significantly reduced or is completely cured. If you don't enjoy results that good or better within the first 90 days of following my treatments, I don't deserve your money. You have every right to ask for a full, no-questions asked, same day 100 percent complete refund anytime you decide. And if you decide to you want a refund, there'll be no questions asked and no hard feelings whatsoever on my part. ​No hassle, no questions, zero additional terms. My 100% guarantee to you. Why Is Your Varicocele Causing Pain? Varicocele pain is simply caused by pooling of blood (which is toxic), and poor lifestyle habits that are unhealthy for the testicles. Poor lifestyle choices include anything that's unhealthy for the testicles and worsens varicocele swelling and toxicity. Few examples are: Over-heated testicles, poor bowel health, smoking cigarettes, high-stress exercise and activity, sitting for prolonged periods for travel or work, etc. Varicocele toxic blood pooling simply occurs because the valves are unable to bear the burden of the blood pressure and so the blood does not circulate well and pools. Pooled blood causes over-heating, reactive oxygen species damage, hyper-hydration, and toxin buildup. The result is damage to the testicles and sperm. If left untreated, over time, varicocele pain develops into infertility or hormone problems. 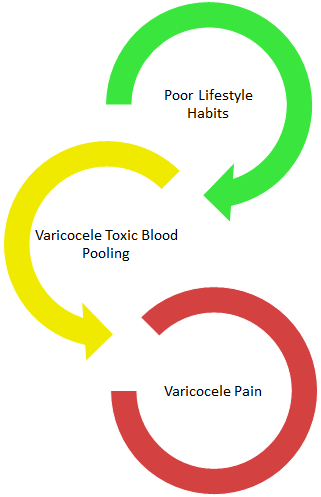 Poor lifestyle habits and varicocele blood pooling lead to varicocele pain. Right now, you can cure varicocele pain without surgery at home using natural treatments. "Natural treatments" stand for specific lifestyle changes to improve testicular health, and specific ways to improve blood circulation to treat varicocele toxic blood pooling. Please visit this page for examples of varicocele pain treatment. How to treat varicocele at home without surgery.